It has been quite a long time since we’ve posted about Malaga and although I personally hadn’t visited this historic city before, I thought I knew all there was to know since it is one of our most popular locations – and home to one of the very best Spanish schools in Spain! I certainly didn’t realise how fascinating the city itself was, or how special it is for the visitor that wants it all – great food, historic landmarks, large city nightlife and vast stretches of beach. Malaga gave me my first introduction to Spanish culture, proving to me that it is a gorgeous city, full of wonderful surprises. The city has everything I imagine of Spain, and more! Not only does it have beautiful beaches, friendly people, and a laid back seaside atmosphere, but there are also historic buildings, famous cathedrals and museums, and an amazing night life to explore throughout the city! My classes in Malaga ended in the early afternoon, so I had the rest of the day free to visit the nearby city center and learn more about my host country with my new friends. The Spanish day conveniently is much longer than I am used to, with dinner at about 10pm, so after school I got to enjoy my lunch, siesta, a walk around the city to view the beautiful buildings and architectural styles that were so new to me, and a cultural activity (cathedral or museum), and then the nightlife! Plaza de la Merced is where all the students and locals start the night- just a great place to talk with your friends, relax and have a drink or a laugh before you start your night full of salsa dancing! You have got to love Spanish public holidays (‘fiestas’)! Yesterday was Dia de Andalusia… and let me say that it was a great day, spent with lots of friends at the beach. But let me say something else and get it over with… I LOVE this place. Absolutely love it. Sorry mom and dad… I am never coming home! We started the day off with a nice American breakfast. Dillon’s parents have been so kind to bring us some pancake mix… and Vermont’s Best Maple Syrup. It was nice to sleep in, and awake to the aromas of an already cooked and delicious breakfast. Now that I think about it… Malaga could really use a Pancake house. It might be one of the only things it is missing. If only I could finance that…! My experience in Malaga was breathtaking from day one! I’ve just returned from Malaga and I already miss its amazing beaches, the bustling and intimate city center, and the incredible location of the mini-campus where I took classes during the day and also had my accommodation in the comfortable on-site student residence. Upon arrival, I left the airport terminal and uttered enough Spanish to catch a taxi, where we then drove up a curvy, windy road up a mountain. 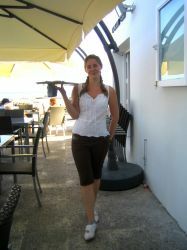 I was really excited because I knew, within a few moments, I would have a spectacular view of the city and the ocean! The sun shone bright on the cliffs to the left and finally I glimpsed the beautiful vista del mar (view of the ocean)! Far below the cliffs leading into Malaga, you see a long row of exotic palmeras, the palm trees that have come to characterize many Spanish cities that boast a wonderful tropical climate. And finally, just before the taxi begins to descend into the city, I see a boulevard stretching for miles, filled with people running, walking, cycling, and taking in the last minutes of a sensationally sunny day. I couldn’t help but feel like Leonardo DiCaprio soaring over the bow of the Titanic! I didn’t think I would see another great view like this until I was heading back to the airport on my way home. I arrived in Malaga in September, full of expectation, a bit unsure of my high school Spanish but with an eagerness to learn much more… and within just a month of my arrival, I truly felt like a resident of Malaga, part of the scenery, one of the locals… even though I’d only been there for a few weeks! My apartment was lovely, and just a minute’s walk from both beach and school! I chose a shared apartment, and was happy to find out that I was living with girls from Italy, and Sweden, who also happened to be in my class. Unfortunately i am reaching the end of my stay in Malaga and im so sad. I feel so sad after having met so many people and done so many things. I can honestly say that i dont think i would ever be ready to go, the school and teachers are wicked, the apartment with the amazing view and terrace, the work experience i gained and the many nice people i met from all kinds of countries. Living it and loving it in Malaga!! It’s all change in our school apartment this week! Three new students have arrived and they will be sharing the apartment with me for the next two months. They are so sweet – there’s one Swiss, one Italian and and one Russian. The Italian girl is so nice and most importantly she cooks the best pasta I have had in years! The Swiss girl is always doing exercise and is so fit, and the Russian girl is really funny. I have been so busy with work and school and I am loving every minute! The Spanish classes are great and I never get bored because there is so much variety in the teaching methods. The girls at work are so sweet and are always helping me with my Spanish. If I don’t pronounce things right they won’t give me what I need until I say it right, which is great for my Spanish! After work sometimes we go out for drinks which is great. I always get asked where I’m from and people are always really friendly. 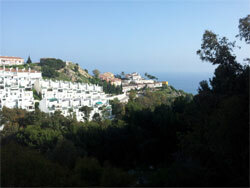 I have been in Malaga for 3 months now…and I only booked two weeks to begin with – now I don’t feel like I can leave! Malaga is seriously different to all the other cities I’ve visited because it is just so Spanish and Andulcian! So much has happened! The best being I got a job working in a bar right on the beach and it is so gorgeous. The people are so friendly at work. I always have to talk Spanish because no one talks English, but they teach me loads of new stuff including some funny chat up lines. lol. Apart from that I have had some new housemates who are all lovely and everyone is always so amazed by our great school apartment with the spectacular view! I still feel lucky eating my brekki everyday on the terrace. Why Malaga’s only problem is its name! 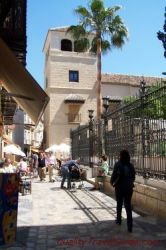 Did you know that thousands of people of all ages come to study Spanish in Málaga every year? This may surprise you, but read on, and you’ll find out why. Málaga city has just one major problem – its name! “Málaga” unfortunately is also the name of the province that includes the resorts of Torremolinos, Fuengirola and Marbella and as a result many people think that Malaga is the just like them – you couldn’t be more wrong – “chalk and cheese” doesn’t do it justice. Luckily they are far enough away not to have any impact at all on life here in Malaga city. 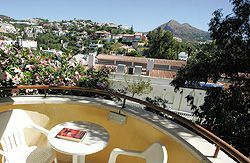 Málaga is in fact one of the best destinations in Spain for studying Spanish and enjoying Spanish culture, and the facilities at the school in Málaga are second to none.